Three generations of Scottish Mum women at the age of 18 ish. Uncovering some family photos, I came across some lovely photographs of my grandmother, that I have not seen in years. We don’t have many photographs as a family, and there are so few of me that it is shocking. I will go to my grave, as almost the faceless entity, mother of 3 adopted children. My grandmother – how hip and trendy was she. I wish there were lots more photographs. 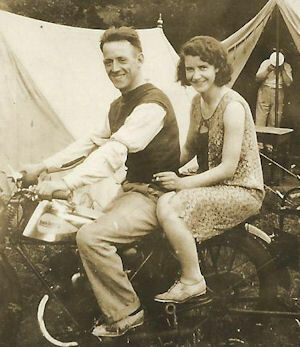 My grandfather took the photograph so I have no idea who she is posing on the bike with. We Scots didn’t all run around in our kilts and sporrans, even in the early 1900’s !! My mother – now where DID she put that dress?? And last, but not least (I hope) – me, with awful bouffant hair, but I wish I was still as slim as that. « Lucky Winner of the LG Washing Machine……………..
What a lovely black and white photos, I love to look at old photos, comparing the difference of past up to present. Oldie pictures are always brill. You all look fab. They are lovely. I wish I had lots and lots more. @Scottish_Mum They are lovely. 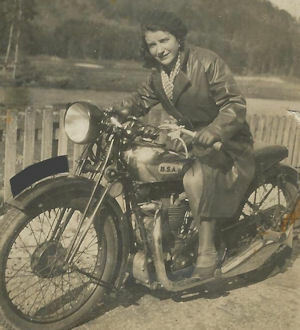 And really cool granny on her BSA! Wow, they are oldie photos. Your grandma looks ace. She does. I can’t remember ever seeing that photo before. I was rooting around my mothers old box when I found it. can’t belive you are a brunette! Yep, brunette, but more grey these days, it paints up ok though lol. I love to look old photos, it makes me bring to the past events that I never been and had been places. I wish we had more to look at. I am going to have to scan through the pile for any more that I can find now. It’s easy to forget that only 15 years before that pic, women were classed as indecent if skirts were above ankle length. It looks like my grandmother was a bit daring, even for the 1920’s. A knee length skirt and a motorbike !!! How I love to look at old photos too. These are great- you can see the family resemblance down the line and you all look so pretty! Gosh you really do look alike, didn’t know your hair was dark and curly! The wonders of straighteners hey?